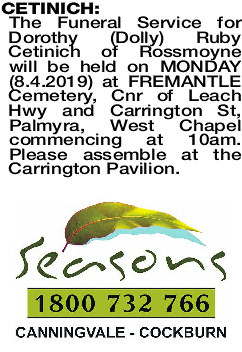 The Funeral Service for Dorothy (Dolly) Ruby Cetinich of Rossmoyne will be held on MONDAY (8.4.2019) at FREMANTLE Cemetery, Cnr of Leach Hwy and Carrington St, Palmyra, West Chapel commencing at 10am. Please assemble at the Carrington Pavilion. Passed away peacefully on 30th March. 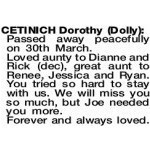 Loved aunty to Dianne and Rick (dec), great aunt to Renee, Jessica and Ryan. You tried so hard to stay with us. We will miss you so much, but Joe needed you more. 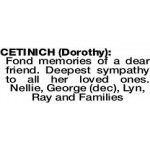 CETINICH DOROTHY In loving memory of Dolly who is now resting peacefully. 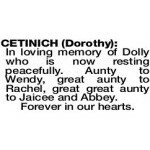 Aunty to Wendy, great aunty to Rachel, great great aunty to Jaicee and Abbey. 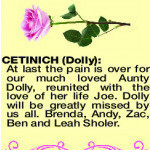 CETINICH DOLLY At last the pain is over for our much loved Aunty Dolly, reunited with the love of her life Joe. 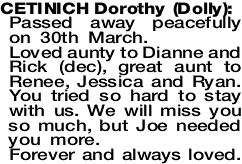 Dolly will be greatly missed by us all. Brenda, Andy, Zac, Ben and Leah Sholer. 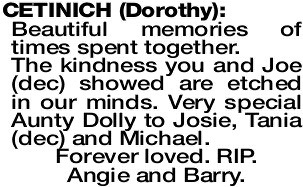 A sad goodbye to our dearest Dolly. So many special memories for you and Joe (dec). We will never forget. 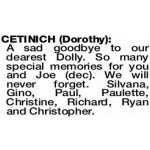 Silvana, Gino, Paul, Paulette, Christine, Richard, Ryan and Christopher. Beautiful memories of times spent together. The kindness you and Joe (dec) showed are etched in our minds. 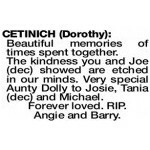 Very special Aunty Dolly to Josie, Tania (dec) and Michael. Forever loved. RIP. Angie and Barry.